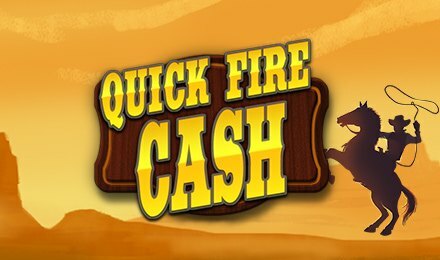 Created by Instant Win Gaming (IWG), Quick Fire Cash will remind you of the wild west! Themed on the cowboy’s life, this game takes you into a rodeo-like movie scene where you can throw your lasso to catch some wins! Playable at Vegas Spins, this game is an instant win one, where they are no paylines or reels! Ready to jump on your horse? Grab a tablet, a laptop or a mobile phone and start your ride! To start the game, you have to roll a dice to set a multiplier. This will allow you to win up to 6x your total stake. You will further have four game rounds which will determine your final multiplier prizes. Begin the game now by placing your stake! Amount of Paylines Selection: You won’t find any paylines on this instant win game. Coin Values: You can choose any coin values which vary from £0.50, £1.00, £2.00, £3.00, £5.00 and £10.00. Game 1: You have to click on any of the barrels which will then reveal two symbols. If you manage to reveal two identical symbols, the prize is yours! Game 2: You have to click on any coins. If the revealed number is higher than the one which is shown, the prize is yours. Game 3: You will have to select a sign and if the sum is above 10 on the same row, you are the winner. Game 4: If a stack of cash is revealed when you click on a money bag, you win the prize. When the rounds end, all of your winnings are added to your balance!